Over the years the Township has continued to expand funding to maintain our local roads. The Road Committee has diligently worked on policy recommendations to the Board along with recommendations on which roads to address over the next year. The Board recently adopted a new policy to address funding and will be looking at ways to increase funds dedicated to our roads during the current budget review for the 2018-19 budget. The Township receives $30,000 a year from the County as a match towards maintaining our local through roads. The County does not provide any match for Neighborhood roads/streets as this work is contracted out by the County. 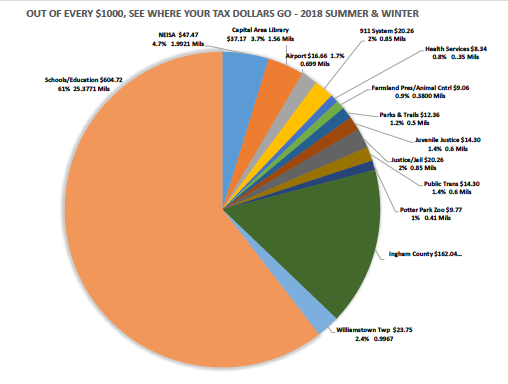 With the average cost of maintenance or reconstruction running from $40,000 to $200,000 a mile (depending on work needed), you can see the difficulty in meeting the funding needs for Township Roads as the Township collects less than $200,000 in property taxes a year. The Township will be creating a portion of the website to be dedicated to our roads so that you can have a better understanding of what type of work is being done, which roads are involved, and estimated time for completion, as well as the policies that have been adopted by the Board regarding prioritization and funding. Ingham County Road Department is responsible for maintenance on Township roads. Please call the Road Department with maintenance issues such as potholes. 517-676-9722. Please be aware that plastic collection has changed. Acceptable items include: Bottles ~ Jugs ~ Tubs ~ Containers ~ Empty Clean Dry and Loose. No longer allowed: Trash bags ~ plastic bags ~ plastic toys ~ Furniture ~ Buckets ~ Oil Containers ~ baskets. Please help the Township as we continue to find ways to recycle your unneeded items. Please review the attached document for the May 7th Election for residents living in the Okemos School District. If you have any questions, please contact Clerk Mark Steinberg or Deputy Clerk Robin Cleveland at 517-655-3193. May 7th Election details. Spring Clean Up May 11th! It's that time of year to do a bit of spring cleaning. The Spring CleanUp is scheduled for May 11th. Please take a look at the flyer as the Township has expanded what is being accepted! Thank you in advance for your patience during the event. NEISA has received a grant for aiding residents in checking and updating smoke alarms and CO2 monitors. Please see the flyer for more information. Williamstown Township is looking for amateur photographers to participate in its first photo contest! Participants will compete for prizes in three age categories: 12 and under, 13 to 17, and 18 and older. The contest ends on October 22, 2019. Please see the rules , permission form, and on how to submit your photos to enter. No cost to participate!